Nike Kyrie 2 "Kyreer High"
To commemorate Kyrie's career high last year, Nike added a default colorway which they called "Kyreer High". The shoe has that distinctive Cleveland Cavaliers colorway of blue upper, with gold accents which is present in the midfoot strap, tongue, and laces, and wine red midsole. 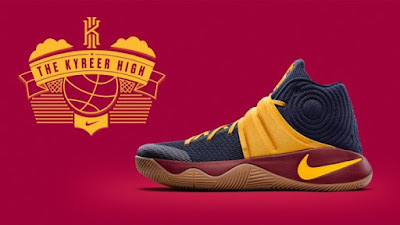 A gum outsole was used as well which really bites the floor and would be very helpful especially if you pattern your game to Kyrie who enjoys lashing out those vicious ankle-breaking crossovers. If you are a fan of Uncle Drew, this might be also a good part of your collection. The shoe retails for $150 which you can get <HERE> via Nike iD.